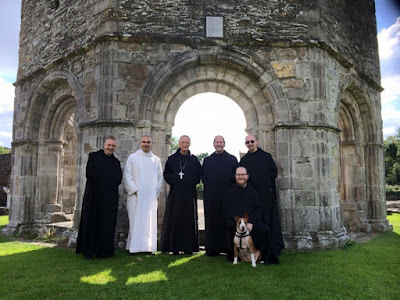 Silverstream Monks with guests visit Old Mellifont Abbey. Left to right: D. Basil McCabe, D. Ildebrando Wehbe, the Rt. Rev. Dom Antoine Beauchef, Abbot of Flavigny, D. Mark Kirby, D. Benedict Andersen, D. Finnian King. On Thursday, 6 August, feast of the Transfiguration, Dom Benedict Maria Andersen (a native of Denver, Colorado) pronounced his final vows as a Benedictine monk of Silverstream Priory and received the monastic consecration. Father Benedict, 34 years old, holds degrees from the Lateran University, Rome, and from Saint Vladimir’s Orthodox Seminary, New York; he is a skilled typesetter and designer of liturgical books. Both of you, as well, are living, with the Blessed Virgin Mary, and in her, a festival of passage. You have completed the first stage of your pilgrimage — not on the way to Chartres, as you have already done twice together – but on the way to the altar where you will pronounce the vows that, for the next three years, will bind you more closely to the Lamb of the Holy Sacrifice. You are passing from a very short time of apprenticeship to a lifetime of labour; from sparing tears to more abundant tears; from joys to greater joys; and from light to light, for the Apostle says that, «we all beholding the glory of the Lord with open face, are transformed into the same image from glory to glory, as by the Spirit of the Lord» (2 Corinthians 3:18). You are passing from the hidden life of the noviceship to a life that, sealed by your monastic profession, will become even more hidden, for yours it is to enter, more and more, into the hiddeness of the Host. What is our Benedictine life if not a gradual, almost imperceptible, penetration into the hiddenness of the Host: Christ in the sanctuary of heaven and Christ in the tabernacles of the earth? as Christ is hidden in the glory of His Father. as He is hidden in the bright cloud of the Holy Spirit. as He is hidden in the sacred species. unseen, unknown, and forgotten by men. The monk is a man called more to hiddenness than to appearing; more to silence than to discourse; more to the praise of God than to conversation with men. In all of these things the monk participates, here and now, even amidst the shadows and changes of this passing world, in the glorious mystery of the Assumption of the Mother of God. The traditional Gospel for this festival of the Assumption is, as you know, Saint Luke’s account of the hospitality given Jesus in the house of Martha, Mary, and Lazarus in Bethany. It was, by the inspiration of the Holy Ghost, and following a most luminous theological instinct that the Church, for centuries, proclaimed and meditated this Gospel in reference to the all–pure Mother of God, Mary most holy, seated in quiet repose at the feet of her risen and ascended Son in glory. «One thing is necessary. Mary hath chosen the best part, which shall not be taken away from her» (Luke 10:42). Again, by the inspiration of the Holy Ghost, and following a most luminous theological instinct, holy tradition has long applied this same Gospel passage to the monastic vocation, recognising that in a world and, indeed, even in a Church, where too many souls are burdened with cares and troubled about many things, the monk must remain, on behalf of all and for all, at the Lord’s feet, listening to His Word. Today, dearest Dom Finnian and Dom Elijah, you are choosing the best part, and it shall not be taken away from you. You are being given three years during which, bound by your vows, you will enter more deeply into the secrets, and trials, and joys of Mary’s part. In a few moments you will, with Our Lady, enter into the great upward movement of the Suscipe. Might this not have been Our Lady’s own prayer in the hour of her holy dormition: Suscipe me, Domine, secundum eloquium tuum et vivam, «Take me unto thyself, O Lord, and I shall live»? The Virgin Mary was not disappointed in her hope, nor shall you be disappointed in yours. «Know ye that no one hath hoped in the Lord, and hath been confounded. For who hath continued in his commandment, and hath been forsaken? or who hath called upon him, and he despised him?» (Ecclesiasticus 2:11–12). Dom Finnian and Dom Elijah, you have both made known your desire and your resolve to persevere in the school of the Lord’s service established by our holy Father Benedict. You have both declared yourselves ready to risk a fully Eucharistic life, to fall under the overshadowing of the Holy Ghost so as to become a hostia pura, hostia sancta, hostia immaculata, -- a pure victim, a holy victim, a spotless victim. Now, then, in the radiance of the Assumption of the Mother of God, you may make your profession of triennial vows.